The African Union Commission (AUC) says it is committed to supporting African Research and Education Networks like the UbuntuNet Alliance following what the Union described as “inspiring work” by the research and education networks of securing affordable ICT access and usage for the continent’s research and education institutions. Director of the Africa Union Commission for Human Resources Science and Technology (CHRST), Dr. Mahama Quedraogo said it is encouraging to note that since becoming operational, UbuntuNet Alliance has drastically managed to reduce Internet bandwidth cost for some research and education institutions in Eastern and Southern Africa allowing students and researchers in the region come up with innovative and cross-cutting projects that are capable of changing the face of their communities for the better. Dr Quedraogo was speaking on behalf of Commissioner Prof. Sarah Anyang Agbor, the Commissioner of the HRST during the opening session of UbuntuNet-Connect 2017 at the Hilton Addis Ababa Hotel on Thursday, 2nd November 2017. “Huge and prohibitive Internet costs are barring our students, researchers and engineers from sharing data and knowledge and collaborating with their counterparts from within the region and beyond. 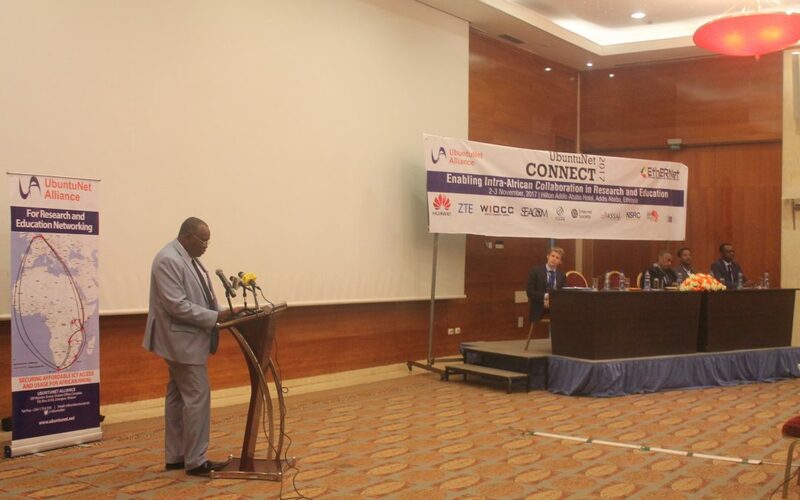 It is against this background that the African Union CHRST supports and commends the noble role that organisation such as UbuntuNet Alliance are playing in making sure that students, researchers and engineers on the continent are not only able to collaborate but also have access to dedicated and affordable high speed internet connectivity,” said Dr. Qeudraogo. The Acting Director singled out impact cases of research and education institutions from Zambia and Uganda that are now paying less for Internet connectivity after the National Research and Education Networks (NRENs) of the two countries connected to the regional UbuntuNet network. Dr Quedraogo then asked governments of African countries to support their NRENs saying strong and economically sound NRENs are a critical prerequisite for robust Regional RENs. He added that such strong RENs can benefit organisations such as the African Union which he said is implementing projects such as the Pan African University PAU to be implemented by the envisaged PAUNET and PAU Odel Institute. He said such initiatives need projects like the AfricaConnect2 which seek to interconnect the three regional RENs of UbuntuNet Alliance, WACREN and ASREN.